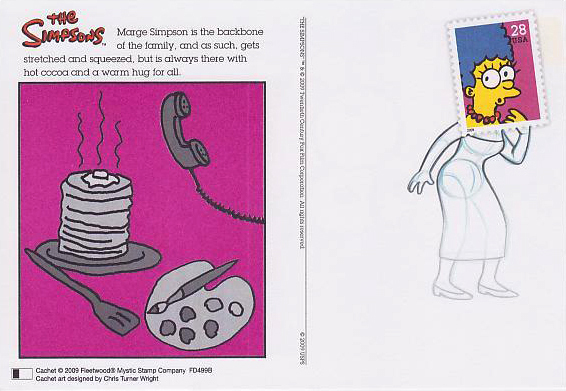 The Simpsons Stamps (2009) | 'TAIN'T THE MEAT… IT'S THE HUMANITY! 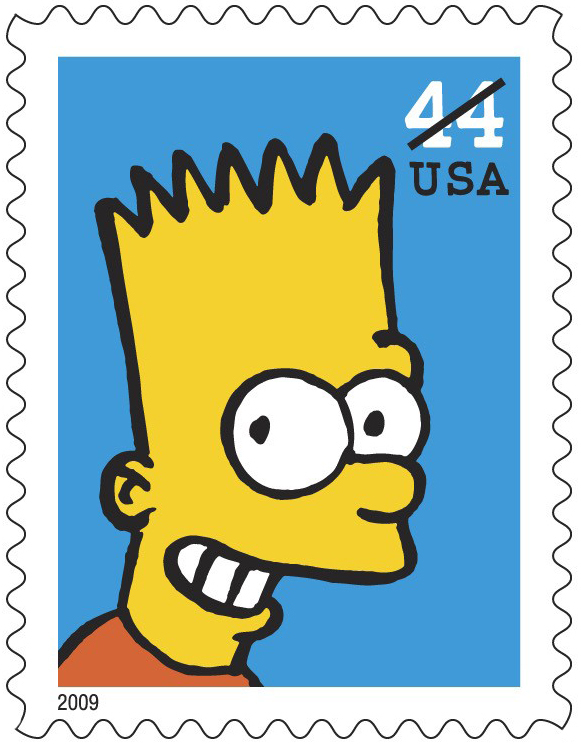 The Simpsons hit its 20th anniversary in 2009 and to celebrate the United States Postal Service released five eye-catching stamps featuring the world’s most popular cartoon family. 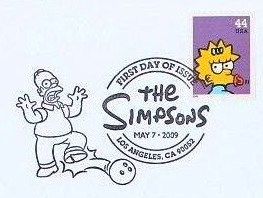 One of the special Simpsons post marks. 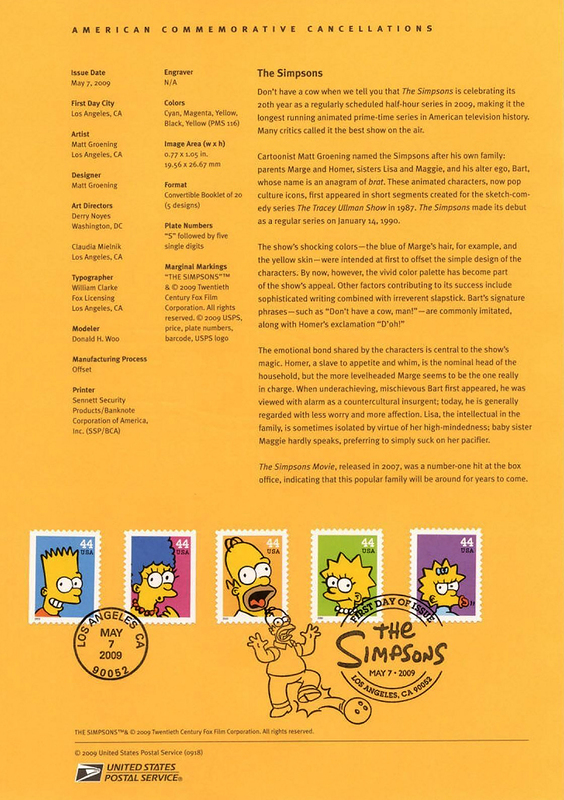 Since their premiere on The Tracy Ullman Show in 1989 The Simpsons have became a global phenomenon, watched in over 100 countries around the world and named by Time magazine as the 20th Century’s best TV series. 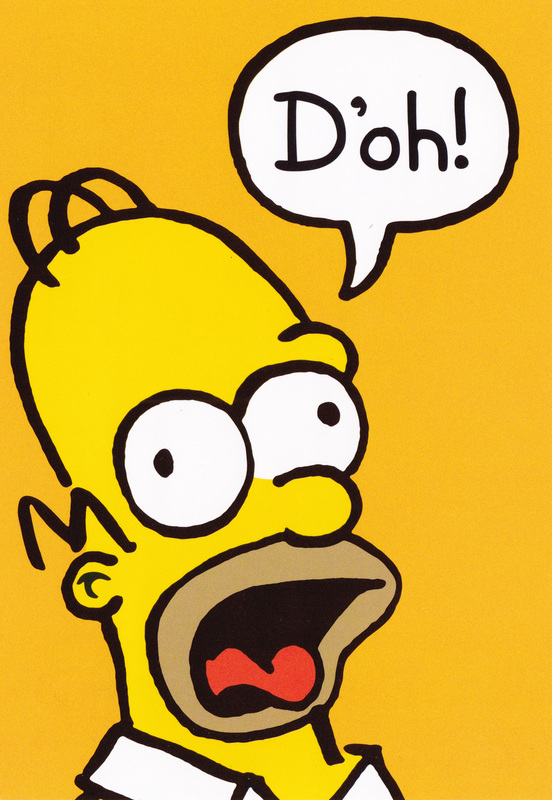 The show has spawned a multi-billion dollar merchandising industry and in 2019 it will became the longest running show in American TV history. 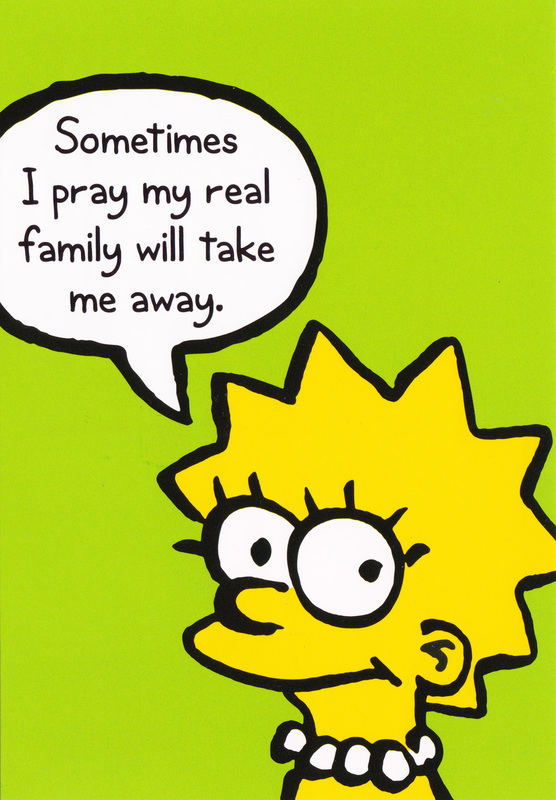 The Simpsons juggernaut shows little sign of slowing down. 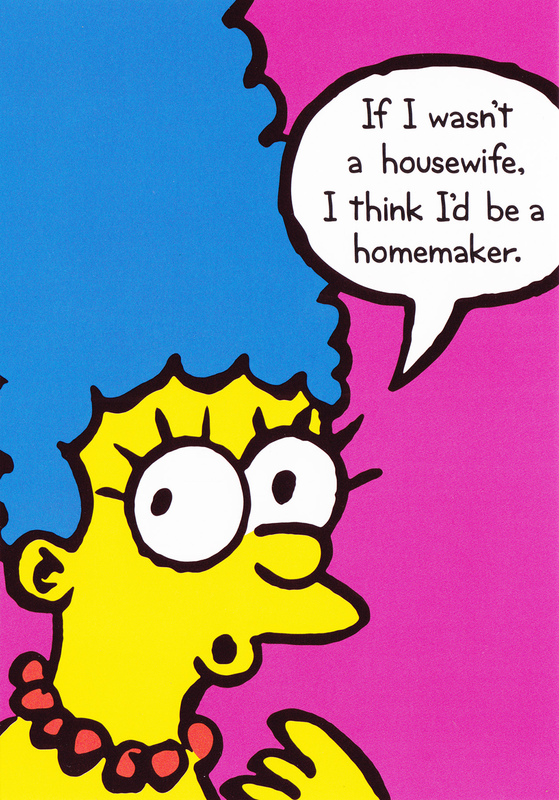 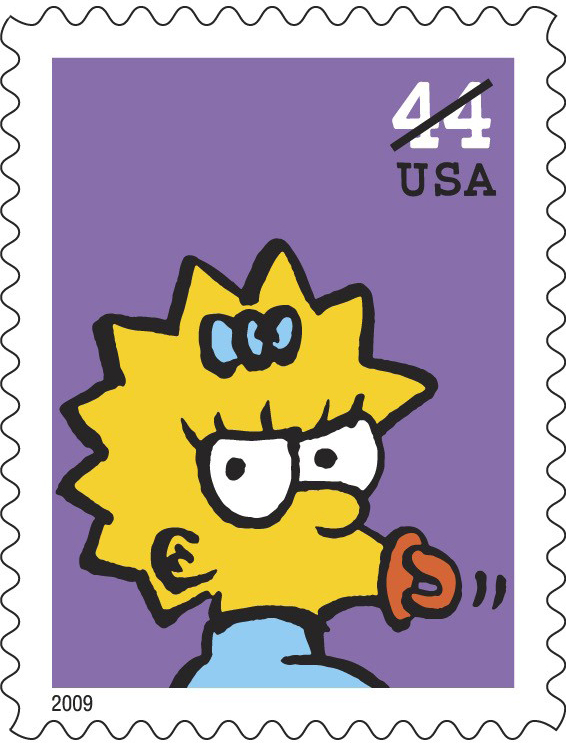 The Simpsons stamps were released by USPS on 7th May 2009 and featured five stamps, each showcasing a member of the Simpsons family — Homer, Marge, Bart, Lisa and Maggie — illustrated by series creator Matt Groening. 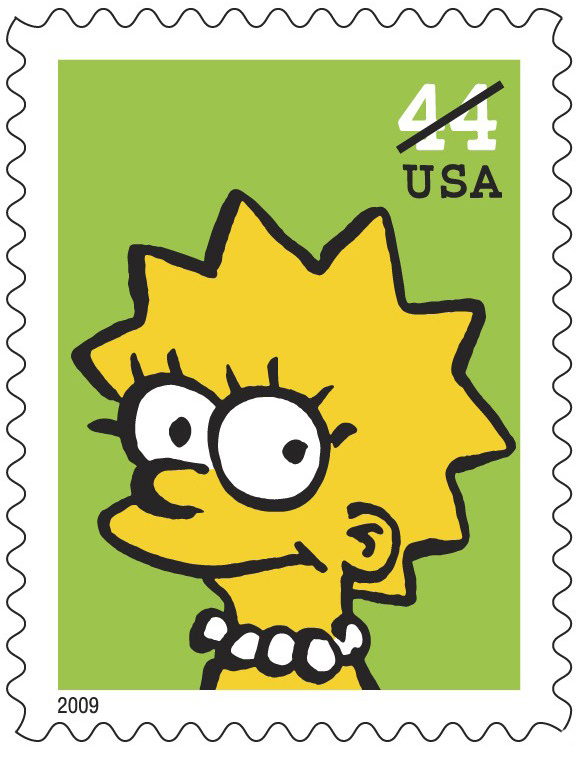 Each stamp was priced at 44¢. 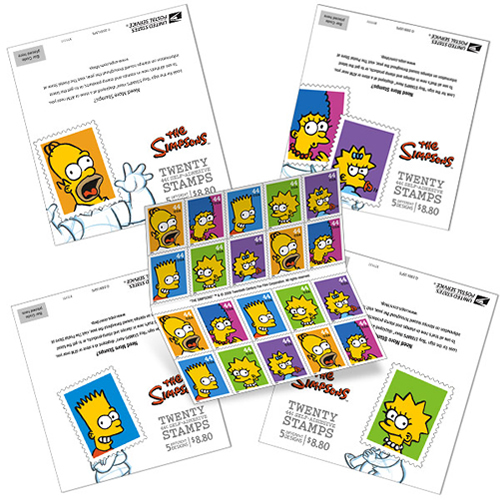 Collectible books of 20 stamps were also issued. 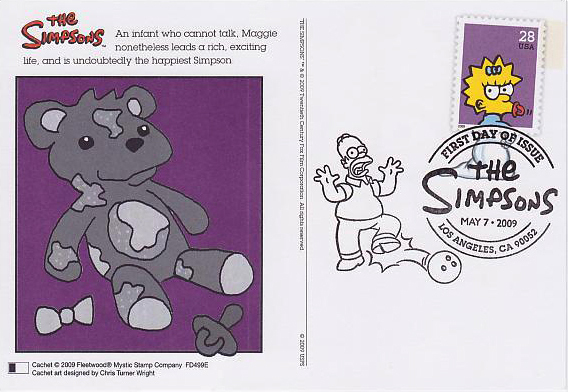 Along with the stamps USPS released a whole host of extra Simpsons stuff, including special first day covers, pre-paid postcards, collectible stamp books, special post marks and even framed giclée prints. 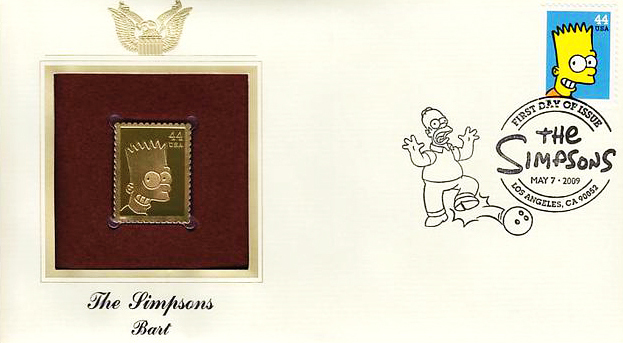 A special gold replica Bart stamp released by the Postal Commemorative Society. 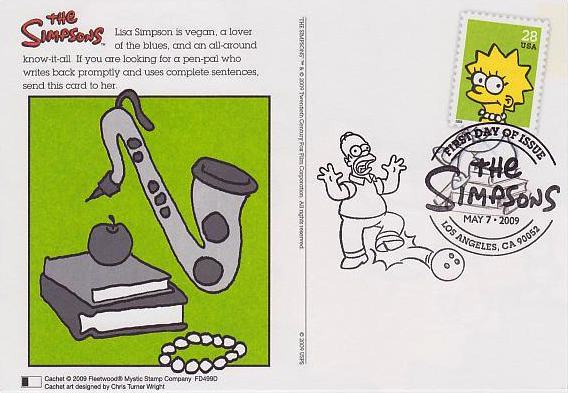 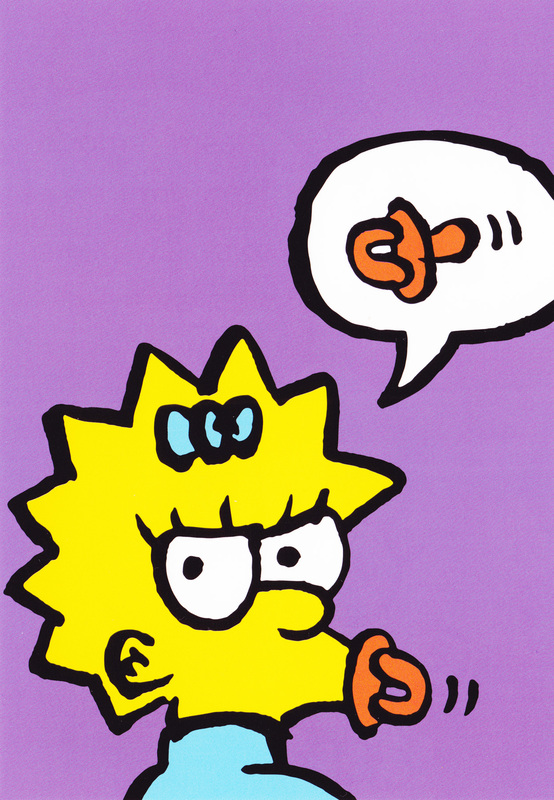 The release of The Simpsons stamps wasn’t without controversy however. 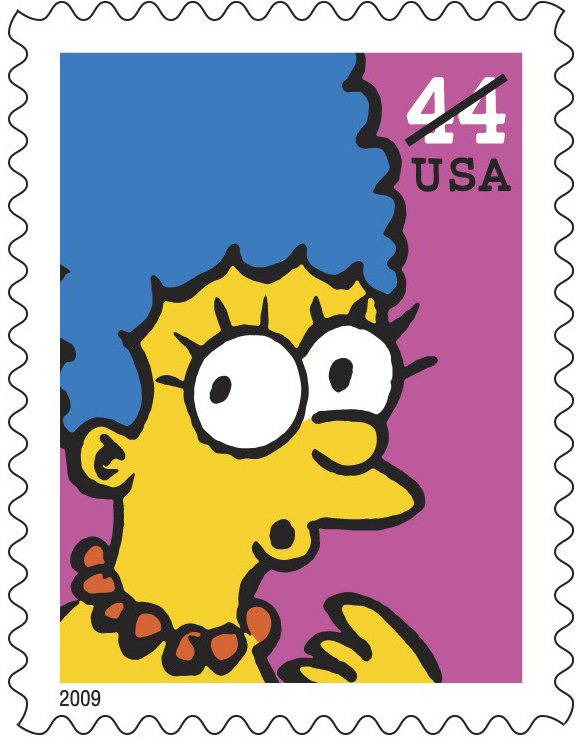 In its enthusiasm to celebrate the show’s 20th anniversary USPS hugely overestimated the popularity of the collection and printed one billion stamps. 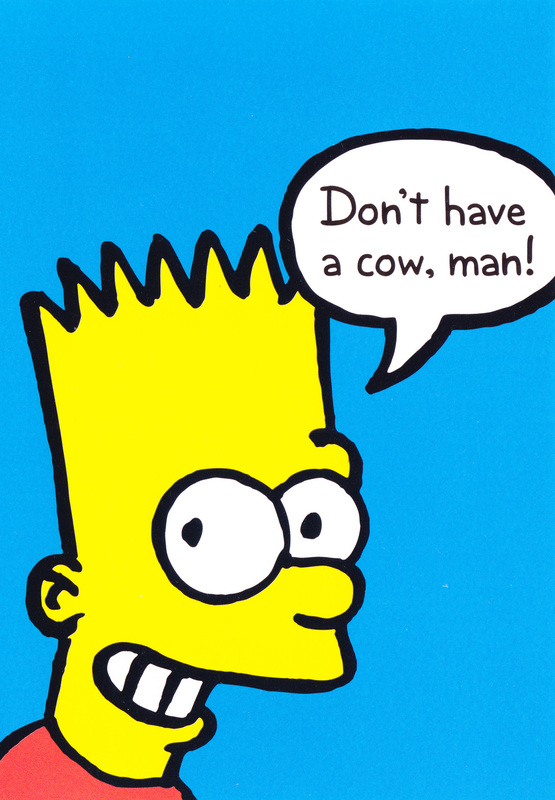 Unfortunately they ‘only’ sold 318 million (which still sounds like a lot to me) and were heavily criticised for wasting money, especially since it was massively in debt at the time. 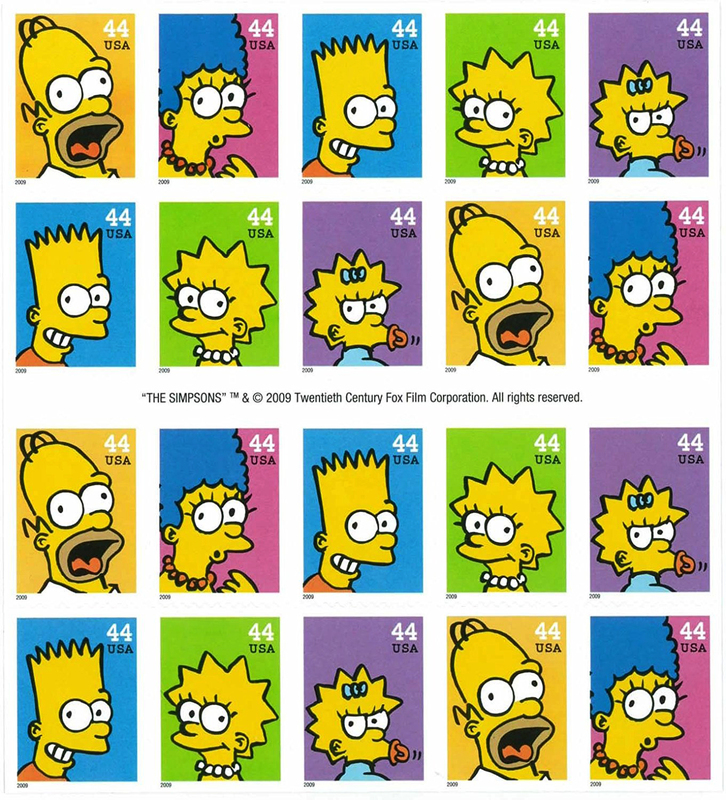 Saying that though I really like this collection of stamps, they’re colourful, fun and it’s nice to see Groening’s artwork used instead of generic images from the show. 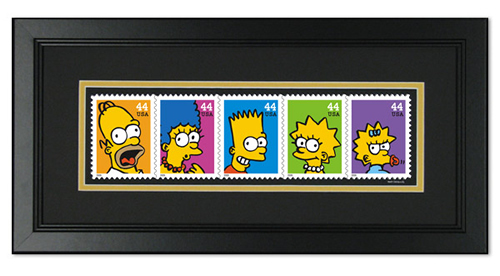 Framed giclée prints of the stamps were released. 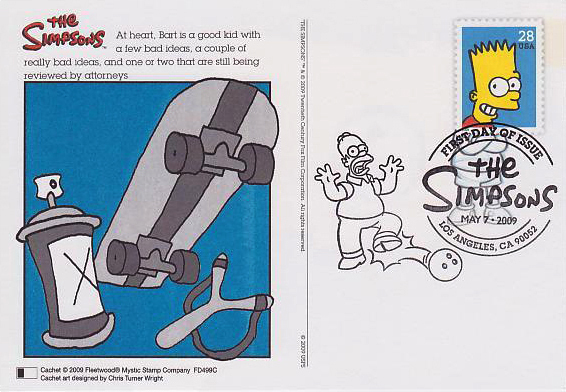 Here are all five stamps from The Simpsons, as well as the prepaid postcards and other promotional stuff. 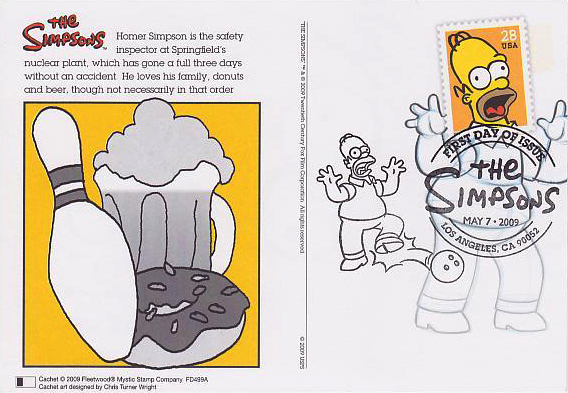 Mmmmm… special edition Simpsons stamps (cue Homer-like drool).